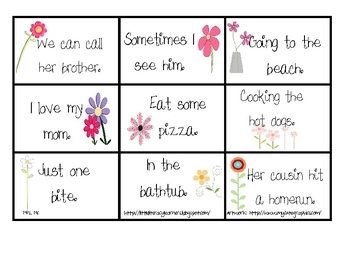 Here is a game I created to help my students practice identifying whether or not a sentence is complete. After reading the phrase, they will be asked to think about whether or not they can answer Ãƒï¿½Ã‚Â¢ÃƒÂ¯Ã‚Â¿Ã‚Â½ÃƒÂ¯Ã‚Â¿Ã‚Â½Who is in the sentence?" and Ãƒï¿½Ã‚Â¢ÃƒÂ¯Ã‚Â¿Ã‚Â½ÃƒÂ¯Ã‚Â¿Ã‚Â½What is it doing?" 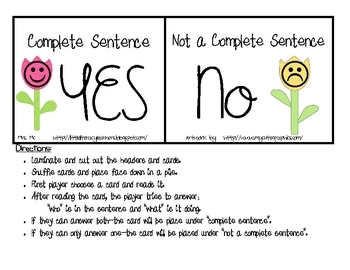 If they can answer both, then it is a complete sentence!